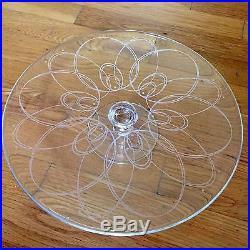 Waterford Crystal Ballet Icing Footed Pedestal Cake Plate Etched Signed 12.75 Pedestal Footed Cake Plate Stand Made in Germany. Fine Large Centerpiece Sideboard Buffet Serving Statement HEAVY. 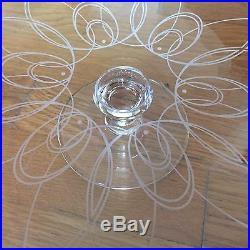 Clear crystal with etched design, made in Germany. Swirl pattern inspired by decorated cake pattern motifs. Great gift or treat yourself - elegant sideboard / table presentation statement centerpiece for serving, fruit display, holiday greenery, flowers. 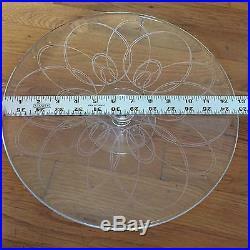 Maximum overall dimensions: 12.75" diameter x 2.5" high. Heavy - weighs 4 pounds , 15 ounces! No chips, cracks, repairs, damage, odors, or stains. Treat yourself or present with confidence! Photos are of actual item listed. 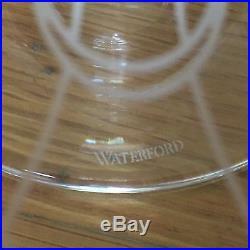 Please see my other Waterford items currently listed. The item "Waterford Crystal Ballet Icing Footed Pedestal Cake Plate Etched Signed Holiday" is in sale since Sunday, January 14, 2018. This item is in the category "Pottery & Glass\Glass\Glassware\Waterford". The seller is "purgemode" and is located in Lovettsville, Virginia. This item can be shipped to United States, Canada, United Kingdom, Denmark, Romania, Slovakia, Bulgaria, Czech republic, Finland, Hungary, Latvia, Lithuania, Malta, Estonia, Australia, Greece, Portugal, Cyprus, Slovenia, Japan, China, Sweden, South Korea, Indonesia, Taiwan, South africa, Thailand, Belgium, France, Hong Kong, Ireland, Netherlands, Poland, Spain, Italy, Germany, Austria, Russian federation, Israel, Mexico, New Zealand, Philippines, Singapore, Switzerland, Norway, Saudi arabia, Ukraine, United arab emirates, Qatar, Kuwait, Bahrain, Croatia, Malaysia, Brazil, Chile, Colombia, Costa rica, Dominican republic, Panama, Trinidad and tobago, Guatemala, El salvador, Honduras, Jamaica, Antigua and barbuda, Aruba, Belize, Dominica, Grenada, Saint kitts and nevis, Saint lucia, Montserrat, Turks and caicos islands, Barbados, Bangladesh, Bermuda, Brunei darussalam, Bolivia, Ecuador, Egypt, French guiana, Guernsey, Gibraltar, Guadeloupe, Iceland, Jersey, Jordan, Cambodia, Cayman islands, Liechtenstein, Sri lanka, Luxembourg, Monaco, Macao, Martinique, Maldives, Nicaragua, Oman, Peru, Pakistan, Paraguay, Reunion.